MERS In South Korea Is Bad News But It's Not Yet Time To Panic : Goats and Soda Fears that Middle East respiratory syndrome could sweep through the region seem to be overblown. But researchers say there's still a lot they don't know about the potentially fatal virus. 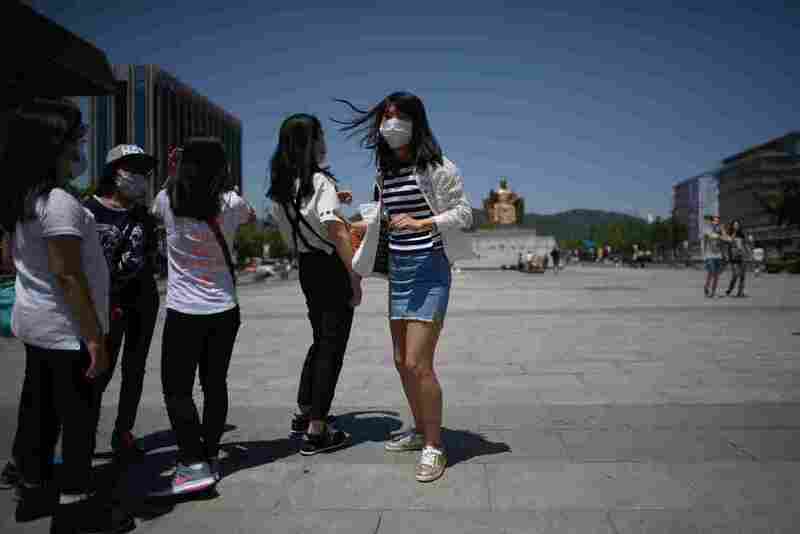 A student wearing a face mask stands in a public square in Seoul on June 3. More than 200 primary schools shut down as South Korea has struggled to contain an outbreak of the MERS virus. Should the world be in a panic about MERS? That's the global health question of the hour. South Korea is trying to get control of an outbreak of Middle East respiratory syndrome. Officials have now confirmed 30 cases of the disease and two deaths. One of the patients traveled to China and remains hospitalized there. More than 1,000 people are now under quarantine in Hong Kong, China and South Korea as a result of the outbreak. There's fear that MERS could be the next SARS, the respiratory virus that swept through the region in 2003, claiming hundreds of lives. Those concerns are probably overblown. But MERS is a hard disease to size up. There's a lot about it that's not yet known, including how exactly it spreads. South Koreans are clearly worried. They're snapping up face masks to wear when they're out in public. But most people who've come down with MERS, both in Asia and the Middle East, did not get it walking down the street. Most got it in a hospital. Twenty five of the cases in South Korea are linked to a hospital that treated the country's first MERS patient late last month. Michael Osterholm, the director of the Center for Infectious Disease Research and Policy at the University of Minnesota. "When you [put] someone who's infectious with a respiratory illness in a setting where there are other sick people, unless you are able to completely control where the air goes from that [infected] person, you're likely to infect other people who are also sick and more likely to be vulnerable to the virus." The country that's been hardest hit by MERS is Saudi Arabia. There've been more than 1,000 cases and 449 deaths there since the virus was first identified in 2012. And many of those Saudi MERS cases were contracted in hospitals. But it's still not even entirely clear how the virus spreads. Is it airborne like measles, which can linger in a room for hours? Does it spread because virus particles cling to doorknobs or bed linens? One hospital in eastern Saudi Arabia had an outbreak that mainly hit people on dialysis. Dr. Trish Perl, an epidemiologist at Johns Hopkins, investigated MERS cases at four Saudi hospitals in 2013. "In healthcare settings we are commonly also doing procedures" — like putting a patient on a ventilator — that can generate of clouds of viral-laden particles that can be readily transmitted to healthcare workers or other patients. What's unusual about the current MERS outbreak in South Korea is that it's so large. There have been other cases imported into Europe, the Philippines, North Africa and even two into the United States but no major outbreaks. Perl says we don't know why the South Korean outbreak has been so large, in part because there hasn't been the funding, access or political will to study MERS. "There's there's really minimal data about the epidemiology [and] the transmission dynamics of this particular organism," she says. In other words, we don't know exactly how it spreads. Perl says the public health measures the South Koreans are using — searching for people who may have been exposed, placing high-risk people in quarantine, isolating anyone who tests positive — should get this outbreak under control. But what keeps her up at night is how little scientists know about MERS. Could the virus be mutating? Is there an effective treatment out there? Are some patients more contagious than others? She hopes the current outbreak will motivate the global public health community to find answers.